In the eternal pursuit of a way to put and end to recoil pain and discomfort, there have been more attempts and schemes than Carter had pills. Many involve permanent modification to the guns, requiring that every gun that you shoot be permanently disfigured. Some methods, such as muzzle brakes, provide little if any benefit in shotgun use, certainly not worth the potential for hearing damage and general annoyance they cause to nearby shooter. Where they do provide more attenuation to the secondary recoil pulse is when employed in high-powered rifles, where a great deal more pressure is available to work with than in shotguns. Of course, the laws of physics do work. We can add weight to our rifles and shotguns to reduce recoil. The problem is, of course, that if we want to cut recoil dramatically we also have to add a dramatic amount of weight. A 7 pound 12 gauge shotgun firing a common trap load (1-1/8 oz. @ 1200 fps) develops about 25.5 foot pounds of recoil, at a recoil velocity of 15.32 feet per second. Sure, we can cut those numbers in half, but it takes much more than a trivial amount of weight to do it. To slash the recoil down to 12.75 foot pounds with a recoil velocity of 7.66 fps requires us to add seven pounds, doubling the weight of our firearm. Going to this extent usually destroys the portability, handling and pointability of our long guns. The EvoShield does not reduce the recoil of your rifle or shotgun in any way. It has nothing to do with modification of a firearm, adding weight to it, changing loads, or drilling ports in the barrel. The EvoShield, at first blush, is a shirt with a recoil pad in it. However, it has no relation at all to the various gel and rubber insert type shirts and vests you have probably used. It also isn’t a “one size fits all” panacea, either. More correctly, it is "one size fits you." I do an awful amount of shooting. Most of it I enjoy immensely, but there is a lot of grunt work in evaluating ammunition and firearms that is just no fun. Firing endless combinations of heavy waterfowl and turkey loads off bag and cradle at the patterning board is just no fun. Firing 300 rounds of .30-06 180 grain cartridges both at targets and through chronographs in a day is also not, but often necessary when publishing deadlines are to be met. A side "benefit" is being able to report on the cumulative effects of recoil. A recent battery of testing left my shoulder scraped and bloody, with lingering soreness that lasted several days. Being sufficiently tenderized to easily discern what recoil pads worked the best (and what didn’t work at all) interfered with the other aspects of firearms and ammunition evaluation. As it happens, my EvoShield arrived the day before I needed to run some 300 rounds through .30-06 Springfield bolt actions. 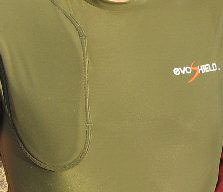 The green EvoShield shirt is made of stretchy, spandex-like material. It is designed to be worn snug. I had ordered a medium, as opposed to the large (or XL) I would choose for most shirts, which was a good thing. Do not think of this as you would a cheap souvenir T-shirt, order it as you would a shirt that would never shrink. Along with the shirt, you receive a black pad about 11 inches long that is sealed in an airtight foil pack. Read the instructions before you break the seal on the foil pack, for as soon as you remove it begins to harden, a process that takes about 10 minutes. Have an unloaded rifle or shotgun at the ready. After removing the pad, you slip it into the shirt's pocket and slip the shirt on. After everything is as you would normally wear it, you mount your long gun as you would normally and repeat once a minute for about ten minutes, not sitting down during this little custom-forming process. That’s it; you are essentially done. The pad is conformed to your shoulder and your style of gun mounting. It takes about 20 minutes to fully cure, but it seemed pretty well cured to me after about ten minutes. When you do your initial forming of the pad, as you mount your gun, you make a flat surface that mates perfectly with the buttstock, both providing you with a flat shoulder pocket that promotes consistent gun mounting and gives better gun to body contact than the natural form of the human torso would allow. The shirt with the formed pad is extremely light and gets in the way of nothing. Wear a regular shirt over the top of it and it looks like you are wearing a green undershirt. I made the hour and fifteen minute drive to my testing area, soon forgetting that I was wearing the EvoShield Recoil Shirt. Some 300 rounds of .30-06 Springfield later, the difference was astounding. No marks on my shoulder, no pain, it didn’t even feel like I had been shooting. Along with the rifle range work, we broke some clays with a couple of 12 gauge O/U shotguns. The virtually complete isolation from the recoil was almost eerie: pull the trigger, a bird breaks, yet you feel next to nothing. The true test was the next morning, where after this amount of shooting I would expect a lot of residual soreness. Again, there was nothing. No marks in my shoulder pocket, no suspicion of soreness at all. As you might be able to tell by now, I am impressed. The EvoShield is going to change things in a very big way for many shooters. EvoShield refers to the material in their pad as a layered composite. How it works is almost self-explanatory. Rough measurements of a 20 gauge shotgun’s buttplate I have here is about 5 inches long by 1-3/4 inches wide at the center. Assuming this was a rectangle, which of course it isn’t, would yield 8.75 square inches of theoretical engagement between your body and the gun. In actuality, it will be much less than that, perhaps as little as half the useable area. The EvoShield is about 11 inches long and averages about 4 inches wide in rough terms yielding somewhere in the neighborhood of 44 square inches of potential engagement between firearm and torso. I guess that the EvoShield gives you 500% to 1000% of the contact area of a conventional buttstock. As it is formed to your own individual upper body, most all of this additional surface area is actually used. If I guessed (and I will) that the EvoShield slashed recoil by 80%, that is an approximation with which I am very comfortable. Let me jump back to the original free recoil calculation example of about 25.5 ft. lbs. for a 7 pound shotgun throwing 1-1/8 ounces of shot at 1200 fps. To reduce that 25.5 or so foot pounds 80% you would have add a pile of weight, about 28 pounds, giving us a 35 pound gun to lower free recoil to 5.1 ft. lbs. Well, we can add 28 pounds of weight to that shotgun, or we can pop on the EvoShield shirt, the result is going to be close to the same, according to our shoulders. Rarely do I give such positive reviews, but in this case, the difference is so dramatic that I am compelled to. So, what are the negatives? Well, there really aren’t many. If you get one for your young son or daughter, as they grow and need new clothes, they will need a new EvoShield as well. You wear the EvoShield shirt next to your skin, so you will need to wash it a lot and that may not always be convenient. If you find yourself using this all the time you might want to buy extra shirts. Supposedly, the shield itself can crack, so do not back over it with your truck. It does add a bit less than a quarter of an inch to your length of pull, so that is something you might want to keep in mind. (By comparison, many slip-on recoil pads add one inch. EvoShield is a major league solution to recoil pollution. That double gun you hate to shoot because of the pounding will now be painless. If you dread sighting in your slug gun before deer season, now you won’t. If you have a touch of bursitis in your shoulder, or have to shoot wimpy loads out of your shotgun because a day on the clays field makes you start to flinch, you won’t any more. If recoil keeps your wife from shooting along side you, your son, or your daughter, or the gun you really like really gets to be a pain after a while, the EvoShield can change that for you. It is a fabulous product. Copyright 2009, 2016 by Randy Wakeman. All rights reserved.